Well, here we are back at the Long Beach Convention Center for the Cycle World International Motorcycle Show. I’ve been coming to this show for as long as it’s been around..haven’t missed a year and I gotta say this is the most crowded I’ve ever seen. An interesting note here is how many women were there and not just beacause the man in their life dragged them along…many were actively trying on motorcycles. The manufacturers are beginning to see this trend as seat heights are getting lower, bikes getting lighter and even colors are changing a bit. The clothing and accessory market for women has exploded. More than leather chaps and fringed jackets, companies like ICON have gone all the way into high tech gear sized and styled for women..lots of pink, light blue and more. Joe Rocket has also jumped on the bandwagon. It’s a good sign. Speaking of Ducati…last year the Italian firm showed their ‘Sport Classics’ for the first time and everyone was truly excited..excitied enough to put their hard earned $$$$ down a year in advance! Well, now they’re showing in dealers and they’re beautiful. 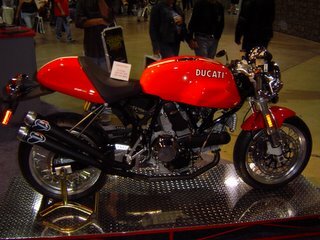 The one example showed at this show..see picture….oh so sweet..but Ducati had a sign on the seat..”please don’t sit on the motorcycle”..damn! But beautiful. Another bike I was really intigued by since seeing the pictures is the new Kawasaki NInja 650. A really nice motorcycle. Will it knock the Suzuki SV650 off?? The Kawasaki is a bit taller but a better seat to bar relationship. It’s a very cool looking motorcycle and should sell really well to newcomers and experienced riders who like mid-size bikes for commuting and canyon riding..but..it’s too bad Kawasaki stuck the ‘Ninja’ moniker on it..insurance companies just love that name..cha-ching!!!! This entry was posted in Helmet Time on December 15, 2005 by themotoworld. 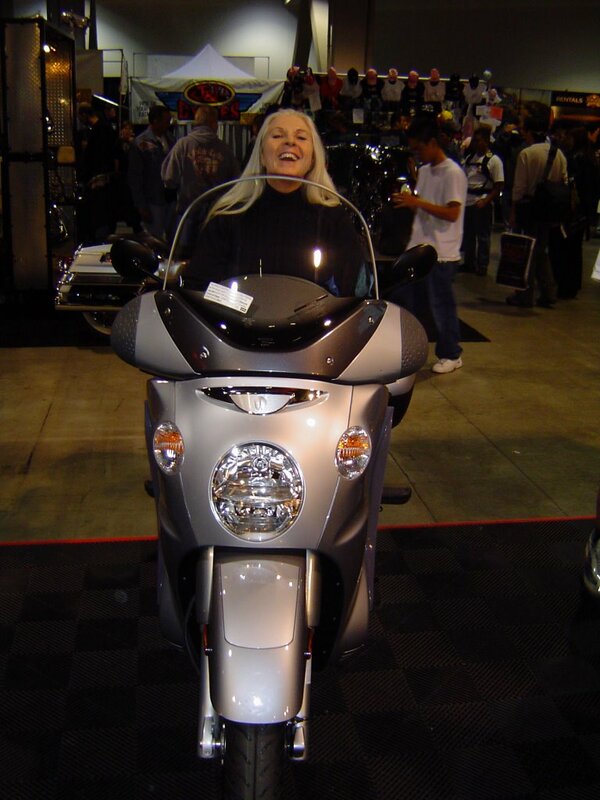 Well, this past weekend was the big M/C show in Long Beach, California, my wonderful pillion Heather and I spent a few hours oggling the latest from Japan, Europe and the good ‘Ol USA. Besides the show, there was an Arena-Cross event also scheduled so the parking lot was full of motorhomes and trailers getting ready for the Saturday night event. Wait, let me rephrase that..the motorhomes and trailers weren’t getting ready for the Arenacross, but the bikes and riders inside were! There were some very interesting things going on at the show…besides all the pretty young girls at each manufacturers display…the interest in high zoot Scooters!!!! Suzuki and Piaggio seemed to be the main focus of this attention. The Suzuki Burgman attracted it’s fair share of admirers but the oohs and aahs mainly came from Piaggio and Vespa..same company, different scoots. We checked out the Piaggio Scarabeo 500, very cool and amazingly comfortable for two. Fully setup for touring with hard saddlebags and a tail trunk this scooter has tons of storage and plenty of oomph for solo touring and maybe just enough for two up. 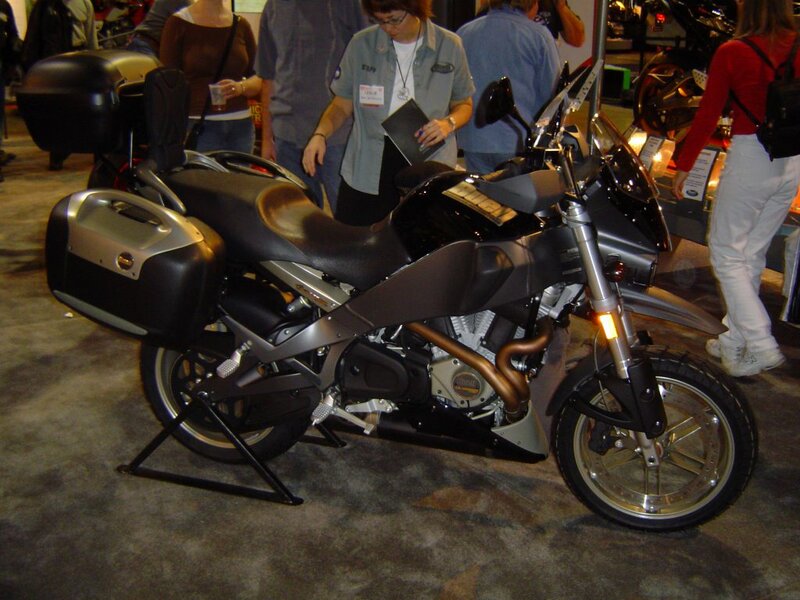 However…at $7399.00, pretty pricey compared to a regular motorcylcle with a bigger motor and much more power. But if you want great comfort and an automatic transmission..this is your new ride. For around town scootin’, you can’t beat the Vespa 250. Classic Vespa styling, plenty of power for getting around town or to and from work..a gazillion miles per gallon and folding racks front and rear for hauling groceries. A very neat little ride. You should have seen how many people were lined up to sit on them and like them. Especially women but plenty of guys as well..Scooters are gaining a cool factor in a big way!! One of the highlights of the show for me was the new Kawasaki ZX14! 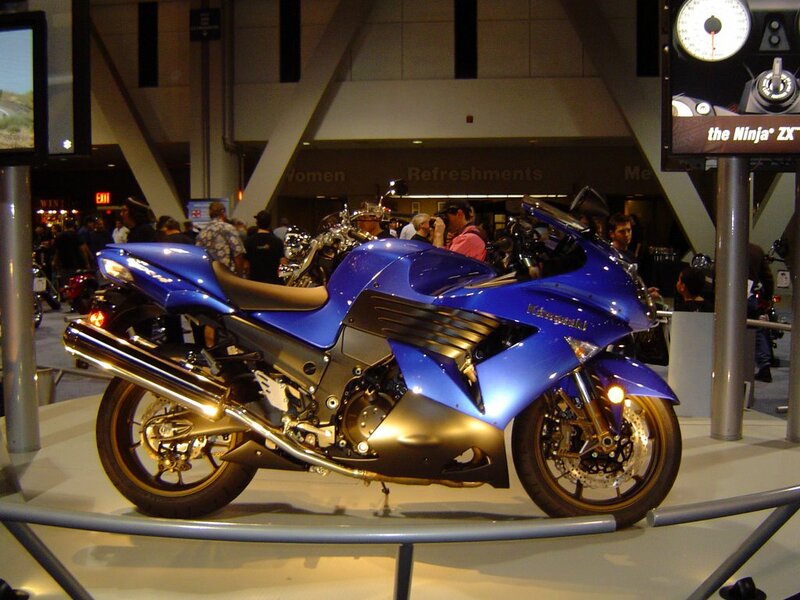 Wow…lined up to knock the Suzuki Hayabusa off the top speed throne this is a beautiful motorcycle. It’s not as sleek as the ZX10 but still very stylish. It looks bigger from the side than it does while sitting on it. Sitting on it was surprisingly very comfortable, much better than the Hayabusa. The seat is wide and firm enough to support you well and doesn’t jam the family jewels against the tank. When Heather got on the passenger pillion we were amazed at how much room there was for two! And she had plenty of leg room…most sporty bikes have barely enough passenger room for a very small teenager and then for only a little while..but the ZX14 was roomy. The textured material seat also helped eliminate sliding forward into the pilot. All in all a great bike for ultra highspeed touring. Hopefully Genmar will make some handlebar rises for this bike and then it will be damn near perfect!! Speaking of damn near perfect…for two up riding we didn’t find anything better than the Suzuki DS1000 V-Strom. Despite being kind of bulbous looking and feeling a bit heavy, this was far and away thee most comfortable bike we sat on. A little tall..no problem for me, I’m 6’2, but Heather is only a shade over 5’3, so getting up to the passenger peg to get aboard was a little bit of effort but once on…perfection! While we were looking at the bike a couple stopped and gave us a 15 minute dissertation on how much they LOVED their V-Strom. Lots of traveling fully loaded..30k miles with nothing more than basic maintainence and amazingly comfortable. A good recommendation I think. Because we tend to travel quite a bit on different motorcycles..Yamaha TDM850, Triumph Daytona900, and Ducati Darmah we look at all kinds of bikes for two up riding. 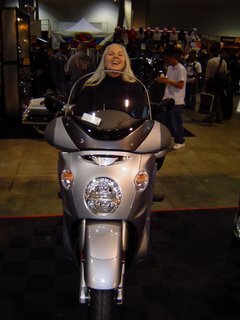 We sat on a wide array of bikes except for the Gold Wing and BMW LT..we’re not quite that old yet!!?? The Aprillia Cappanord was a pretty nice adventure tourer as was the Ducati Multi-Strada, but neither was as comfy as the Suzuki. I wish Triumph had been at the show..I would have liked to try the Tiger again. The MotoGuzzi Breva 1100 was a favorite of mine. I’ve always had a thing for Guzzi’s and someday hope to have one parked in our Garage-Mahal. I spoke with the Guzzi rep and he said that the new Guzzi Norge sport tourer WILL be coming to the US Next June or July and will be priced in the $15-16,000 range. The Vintage Tourer will be showing up in September and the price is unknown at this time. The Breva 1100 has a very light feeling and looks great. 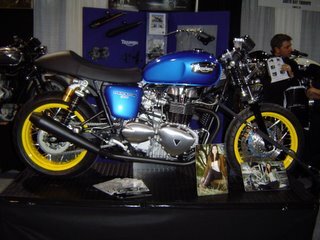 It is too bad that the Triumph factory wasn’t there but South Bay Triumph of Lomita California was and they brought some of thier customised Bonnevilles. Using the Thruxton model as the base they have a variety of High Performance mods that you can get done that make the Bonneville a very exciting ride. And last but not least is the new Yamaha FJR1300. Clutchless shifting. Anytime anyone of us sits on a motorcycle the first thing we do is try the brake and clutch levers..but wait..there’s no clutch lever!!!! Feels..well, a bit odd. THe FJR has an F1 style paddle shifter on the left handlebar. After a few minutes with it, it felt very natural. You can switch to foot shifting but..why??? Let’s see how it works in the real world of long distance riding but I think Yamaha is on to something here. This entry was posted in Helmet Time on December 12, 2005 by themotoworld. This entry was posted in Helmet Time on December 4, 2005 by themotoworld.